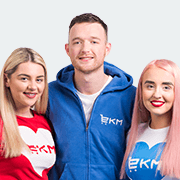 EKM has been supporting UK businesses since 2002 and continues to be the perfect tool for anyone in the UK to sell online. We pride ourselves on the quality of our 100% UK-based support team– happy to help via telephone, email and live chat. From day one, your very own Account Manager will get you set up and selling within a matter of days. Unlike our non-UK-based competitors, EKM offers a simple and intuitive way of adding delivery methods for your UK customers. With EKM, there’s no messing around with tax settings that are geared towards a US market. “Having used many companies and especially the most famous USA-based ones which we’ve all heard of, they all had their disadvantages. We were determined to find a UK-based alternative that offers all the benefits without the disadvantages. Ready to start selling online in the UK?